Zanzana’s beloved one is Albanian. He and Zanzana really like beans, as every type of simple, genuine food: you will not find a lot of ‘Nouvelle Cuisine’ in Zanzana’s kitchen! Zanzana also thinks that beans don’t have the place they deserve in contemporary kitchen, while she prepares them at least once a week. Cannellini are small white beans, with relatively soft, thin skin, quite sweet taste. The best ones in Zanzana’s opinion are the ‘new’ ones, the smallest ones. They are very common in Mediterranean kitchen and also throughout Italy, especially in Tuscany, where you can find memorable recipes for them. This is the recipe Zanzana prepares more often, inspired by the way beans are prepared by her husband’s family. It will take you up to three hours preparation, even if you can do many other things while they boil. Soak the beans in water for at least 8 hours, then boil them for at least 2 hours. At the same time, prepare an onion ‘soffritto’ (fry the onion with olive oil), then add it to the beans after at least one hour cooking, together with salt. After half an hour add the tomato sauce and leave the beans cooking until they become ‘creamy’. Last but not least, complete with a little chili and butter (25 gr.). P.S. 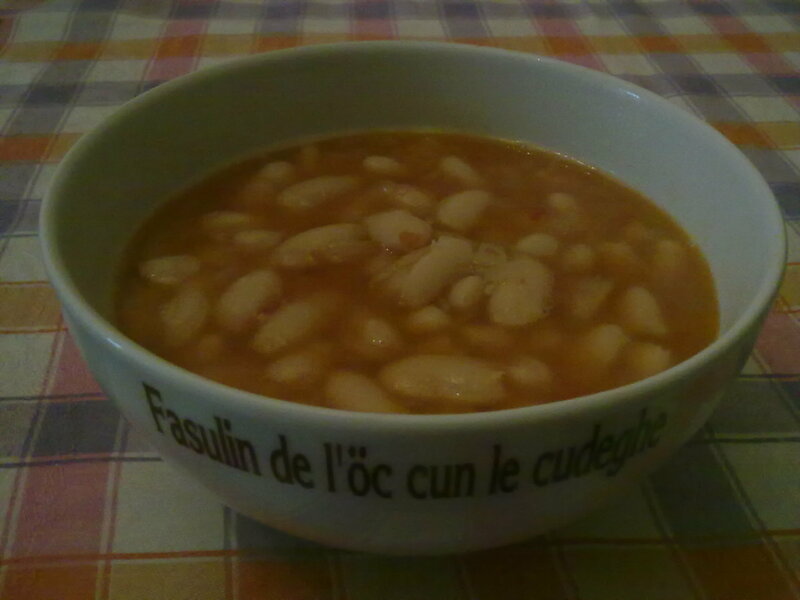 The writings on the bowl above are not in Albanian, but in a Northern Italian dialect, from Cremona region. Zanzana will tell you how she got that!